The formula doesn’t taste great – like watery pudding with a biting, cheesy aftertaste. But it’s something Moller needs to treat a rare metabolic condition she’s had since she was born. After 30 years, she’s gotten used to it. Moller’s insurance comes through her husband’s employer, and doesn’t cover her formula. Like many treatments for rare diseases, the lack of well-funded research and the tendency of insurers to focus on the bottom line mean patients sometimes can’t afford necessary medical supplies. There are 16,000 people in the U.S. with PKU. Many of those people pay close to $1,000 each month to buy the formula they need. So patients fight two battles — managing their disease and managing how to pay for it. Moller’s rare condition is called phenylketonuria, or P.K.U. People with P.K.U. can’t process a certain amino acid in protein. 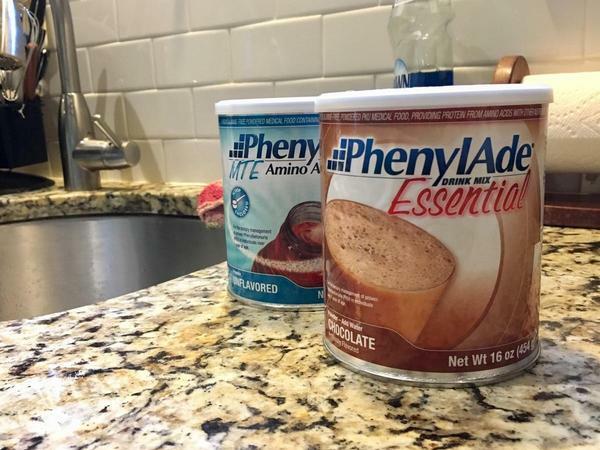 To make up for the protein they can’t eat, phenylketonurics drink the special lab-made formula that removes the offending amino acid. Most use a powder, although other forms are available. If people with P.K.U. don’t have their formula, two things can happen: First, patients might not eat any protein at all and become malnourished. More commonly, they end up eating protein in regular foods, and the offending amino acid builds up in their brains. That can give adults behavioral and intellectual problems and it can cause permanent disabilities in children. When a supplier did not ship her formula on time, Moller, a social worker, went without. She couldn’t remember her clients’ names. “It’s essentially like if you hadn’t eaten all day, like you’re on a fast,” Moller said. Moller works with women in desperate or risky situations as part of her job. She said she needs to be healthy not just for herself, but for her clients. Moller was on her parents’ insurance plan until she turned 26 and never had difficulty getting her formula. That changed when she transferred to an Anthem plan through her former employer — going from New Hampshire to Missouri. “I never anticipated that they would actually deny me coverage for such an essential medical product,” she said. But that’s exactly what happened. Moller tried to appeal the decision with help from the advocacy organization the National P.K.U Alliance. She spent hours during her breaks and lunch at work appealing to her then-insurance company, Anthem. It didn’t work. “They said even if this was the sole source of nutrition for me, they would not cover it,” Moller said. The federal Food and Drug Administration refers to the formula and products like it as “medical foods.” The FDA doesn’t regulate them as prescription drugs, but they’re more than just food. Unlike people with celiac disease or Type 2 diabetes who also require special diets, people with P.K.U can’t manage their condition without them. Medical foods started out as a prescription drug, but manufacturers re-classified them as a food in the 1970s to cut down on research costs. So even though they function as a medicine, many insurance plans still categorize such medical foods as oral nutrition – which isn’t usually a covered benefit, said Dr. Jerry Vockley, a pediatrician and chief of medical genetics at UPMC Children’s Hospital of Pittsburgh. Insurance companies are profit-driven businesses, said Vockley, who has studied the tension between insurers and people with rare genetic diseases. “The free market pressures are all to save money, and not to save patients,” Vockley said. Representatives from Moller’s current insurer United Health and her former insurer Anthem declined to be interviewed. In an email, a United Health representative said that certain plans it offers do offer medical foods coverage for certain conditions. Many insurance companies worry that if they cover formula, they might have to cover other food-based treatments, too, Vockley said. Ninety-five percent of rare diseases lack an FDA-approved treatment. Many insurers use FDA approval as a shortcut to decide whether to cover a given treatment, said Tim Boyd, state policy director for the National Organization for Rare Disorders. “In general, when you’re talking about treatment for rare disease, you’re talking about a realm of medical services that may not have a body of evidence for their underlying condition,” Boyd said. That FDA approval process proves that a drug works and that it’s not going to hurt anyone, Boyd said. And insurers, in the name of keeping costs down and keeping people safe, don’t want to cover a treatment that hasn’t been proven through this stringent process. The nation’s healthcare system isn’t built to easily accommodate people with rare disorders, which don’t have the research and money behind them that other diseases do. When insurers don’t cover the medication, Bridget Tomic, a dietician at St. Louis Children’s Hospital in St. Louis finds a way to help. 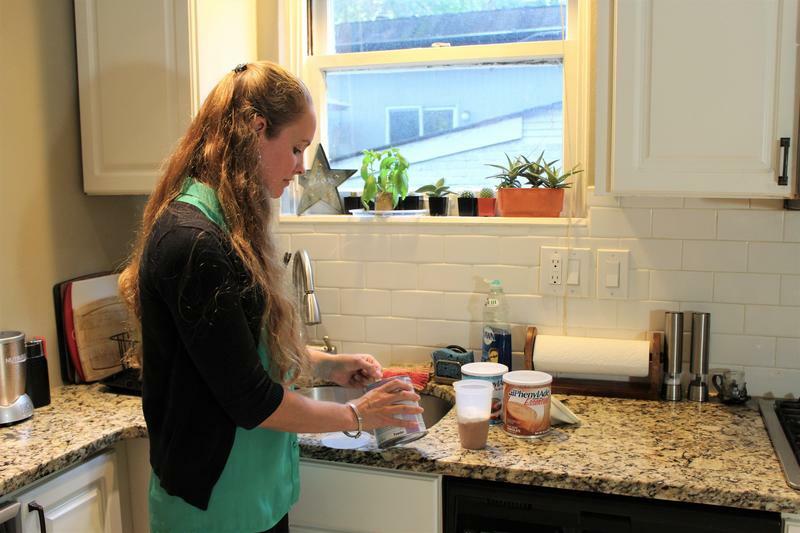 She spends at least 25 percent of her time fighting insurance companies on behalf of her patients, trying to convince them medical foods are essential for their health. “I’d like to spend that time making our clinic better for our patients and really focusing on their diet and making it the best, but it’s so important to get their formula,” said Tomic, who works with people with P.K.U. When insurers don’t offer coverage, she’s found a way to help. Next to the fax machine, there’s a large cabinet full of sample cans of formula with expiration dates written on them in purple marker — medical foods that companies have sent the hospital to distribute to patients. Tomic keeps an eye on when those are about to expire, then calls people who lack coverage to offer them samples. “My coworker and I are really good at watching this and making sure we can find someone,” Tomic said. She regularly sends cans to three or four people around the St. Louis region who have problems with insurance. Moller receives about a third of her formula this way. But the distribution system isn’t a permanent solution, Tomic said. Many times, if people can’t get P.K.U. formula coverage, they’ll abandon their diet entirely and lose touch with their doctor. Other patients swap formula through Facebook groups. Sometimes, they even move to different states where insurance companies are required to cover it. Researchers have suggested creating a model that states can look at as the golden standard for medical foods coverage. States have different laws regarding who insurance companies should cover and for how long. Some require a patient to show financial need before medical foods coverage kicks in. For example, Missouri only requires medical foods coverage until a child turns 6. Illinois doesn’t have coverage requirements, but does a have a state formula program that provides it to residents for life. For more than a decade, the National P.K.U. Alliance has been pushing Congress to require insurance companies to cover medical foods. The most recent effort, the federal Medical Nutrition Equity Act, hasn’t made much progress. But recently, the military has started to cover medical foods as part of its insurance plan, Tricare. People with P.K.U. hope that will inspire more companies to cover patients’ treatments. But Boyd, of the rare disease association, and Vockley, the pediatrician, said all rare diseases patients need to work to get federal attention. That’s what helped pass the Orphan Drug Act in 1983. A coalition of patients and advocates for rare diseases pushed a law through Congress that provide incentives such as tax credits and exclusive marketing rights to drug companies to spur development treatments for rare diseases. “If you add all the diseases together that are rare they actually end up being not all that uncommon,” Vockley said.